Thanks to Sherrill Manufacturing Inc., and their brand Liberty Tabletop, flatware (silverware) manufacturing is alive and well in the United States. Founded in 2005, the company took over the sprawling one million square-foot facility from Oneida Ltd. and is now the only flatware maker left in the USA. Fair trade is a growing concern for the American consumer who has seen the sometimes-deplorable conditions in factories overseas. Owens and Roberts have seen firsthand the conditions in flatware factories in Asia and want to offer consumers an alternative. People are often shocked when they hear about the unsafe conditions, use of child and prison labor and subsistence wages that exist in factories throughout the world. “There is certainly none of this involved in the process of making Liberty Tabletop flatware and we are very proud of that,” said Owens. 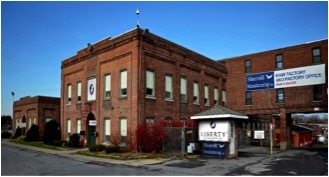 Liberty Tabletop contributes to the Upstate New York job market by providing local jobs. I love a good spoon shop! I am so happy with the flatware purchased from Liberty! The quali tut is top notch. Thank you!!!! Nice to see a quality product and made in this country. Finally. Its nice not to see that “made in China” stamp I will be moving this summer and look forward to looking on your site for new things. Fantastic, I always buy made in USA if available. Thank you. May your success be even greater than the great meals and fellowship which surrounds your products. May your success be even greater than the best food eaten with your flatware! Happy to know about Sherrill Mfg. and Liberty Tabletop! Thanks for sharing the information on Facebook. At some point, please share details so current and potential owners understand what 18/10 stainless steel represents. I’m happy to buy American whenever I can! It is so refreshing to learn that your family business in the USA is thriving. I wish you much success. I may need new flatware in the near future. I, also, have a fee couples getting married and may purchase your product as a wedding gift. I was so enlightened to learn that this Company is well and thriving. Hope your success just multiples in the years ahead. I worked in the jewelry industry in the 70’s and 80’s and we also sold crystal, China and flatware. The trend was already leaning toward stainless flatware and many of the silver companies were getting in on the action. It is hard to believe that all of the silver companies have fallen by the wayside but it is just as hard to believe that your company has stayed and is still producing in the US. Bravo to you and your little company. We need to have more little companies like your’s. To inspire your own children to want to be a part of your company is also inspiring. Keep chugging and growing. It just may save our economy and our country. I am amazed that Oneida has gone by the way side. I am even more amazed that an American company preserved American jobs when so many have been lost to cheap labor over seas. Do you have a catalog of your products? I lived in the area for three years back in the late 80’s. Bless you for believing in your own country. Please post on line items available, and possibly look for expansion in other states than NY. I am not sure if you saw our samples program but it is a good way to see the different finishes and compare the weight and details before you buy. http://libertytabletop.com/product/flatware-samples/ You do not need to return the samples. I live in the 93306 area of Bakersfield where canI buy your flatware? Thank you for your interest in our 100% made in America flatware. Fantastic to hear about more American manufacturing. I come from a manufacturing background and am proud of you all. It is increasingly difficult for small companies to compete in the world market but you found a niche. Give yourselves a big pat on the back. Interesting! I was not aware! Will check you out in the near future! I did not know you existed but will look for your products in the future. I recently purchased another brand of flatware at Wal Mart and noticed rusty spots coming out of my dishwasher. Living in the country we have hard water so we have a water softener installed. How does your product hold up to this. Is there a certain quality I would have to purchase? Thanks so much for your interest in our Made in the USA flatware! All of our flatware is designed to be washed in the dishwasher. If you have hard water, it may be necessary to wipe the knife blades dry rather than let the hard water evaporate on the piece. This is because the knives are made of a different type of stainless steel than the rest of the flatware, and are slightly more susceptible to corrosion from the minerals in hard water. Please feel free to contact me with additional questions. We have a sample of our product in several boutiques throughout the country.There is a store locator function, on our website, to assist you in finding the store closest to you. Samples can also be purchased (3/$8).You do not need to return samples. I was interested to see you are the only left in America. Obviously did not know this. See the stuff in the stores all over but didn’t realize those are ALL FORIEGN? I was also surprised that with such a large square footage facility you only have 38 employees? Keep telling your story! Too many “American” brands have gotten taken over by foreign entities, and it is extremely difficult to trace where an “American” product is manufactured. Keep up the good fight I will be recommending and purchasing your product. Will definitely be looking for your products! America First! Thank you Gentlemen! I will Seek out your products and purchase them! I recieved the Celtic pattern service for 8 as a Christmas gift. My daughter knew I loved the pattern and made sure I got it ! I have to say it is so much nicer in person. I absolutely loved everything from the design, the weight, the shine, and it’s American made ! Thank you for making a product I can be proud to set my table with . Glad hear your still around and growing! Keep up the good work! Wow very interesting and pleased to have learned about Y’all. I’m in Houston and will definitely include Y’all in some upcoming conversations. Great story and truly sounds like a great place to be an Employee as well as an Employer!! Great Job + USA!!! Thank Y’all and Merry Xmas!! Do believe Y’all will have afew orders! Great Stuff – need to get your name OUT there MORE!!! I am glad you are in America. Have you thought about a sister plant in Kentucky. The cost of living is quite nice, low crime and a lot of benefits. I live on the boarder of 2 counties Lincoln and Boyle. Come check it out. Good to hear about your silverware and made in USA! Thank you for staying here in America. I will be ordering a whole new set of flatware very soon. Congratulations to Sherrill Manufacturing for your patriotism, so glad for the jobs in the USA Let’s all buy from Sherrill Company. Show our patriotism to the USA, and keep jobs in the USA. Nice to know about this company. Also the picture shows practical styles not the overly heavy and awkward silverware currently in stores. Good for them! Lets bring back more American companies. I wish iron skillets made by Wagner werestill available. Is your silverware lead free? Hi Jean, yes our silverware is lead free. It made with 18/10 stainless steel which is comprised with chromium and nickel. Thank you for keeping the vest age of American flatwarestill alive. Beautiful craftsmanship. I just bought a set. Anxiously waiting for it to be delivered. They offer lots of classic patterns, as well as some really unique ones! Had been looking for flatware for a long time, I bought from them was because they are American made. Great news… hope your company succeeds and prospers! Do you have a catalogue? Buy American! Thanks for keeping your company going! It’s the small companies I admire most. You provide a much needed product. Keep up the good work! Thank you for the commitment to your community, especially during the hardest times for small businesses. I will be shopping your store. I am so glad I found this out. I have gone 15 years without buying much needed tableware. Is this available in stores? I have thrown away so much stuff because it was not made here. God bless you all. Thank you for your interest in our 100% made in America flatware! We have a sample of our product in several boutiques throughout the country. There is a store locator function, on our website, to assist you in finding the store closest to you. Thanks for letting me know. When I need to replace my current flatware, I will buy yours.. love the made in America. I would love to know what Stores carry your product as i prefer to buy American! Thank you and wishing you much prosperity! I’m so glad you are American made. In the near future I will be in the market for a new stainless set and you will be my choice. Thank you so much! And God bless! Hello – congratulations on your USA success story. Even though I’m not currently in the market for flatware, your company would be my preference going forward. It’s also great to see that you’re using American steel for your products. My question is, do your do export sales to other countries? I truly like to see our products go to other countries, not just to show our pride, but to expand your business success. Again, congratulations on your continued success! This is great but have two question: with the new tariffs imposed how much are you going to raise your prices? I understand why but would like to know the increase. Do you buy American Steele or foreign? Thank you for your interest in our made in America flatware! We use only American made steel so tariffs will not affect our cost or pricing at all. Finally! Time to replace our tableware and it will be USA made! 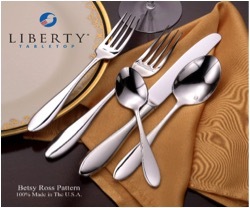 I love my Liberty Tabletop flatware!!!! I recommend to everyone, even if they are not in the market 🙂 Makes me proud to not only support US made products by a small business but to support a fellow Upstate New Yorker. Wonderful to see. I wish you continuing success. God Bless. Great to know ! I will buy from you what I need ! Congratulations to all of you for fighting the fight of manufacturing and providing jobs in the USA. Many years ago at Sibley’s in Rochester, New York I was a china and glassware buyer. We featured all the Oneida products we could. I visited your factory facility in Oneida several times. Oneida flatware and silver was our bread and butter at that time. 60’s and 70’s before moving on to a better climate in Southern California where I still live. Question: What is the origin of the name Sherrill? Here in SOCAL, I ran a high-end chain of furniture stores out of Los Angles by the name of Barker Bros. Our most important line of upholstered living room furniture was made by Sherrill Manufacturing in North Carolina. Buddy Sherrill was a good friend at the time. Curious. Hi Donald – Sherrill is the name of our city. It is the smallest city in New York State and nicknamed “The Silver City”. Do you still make the infants/children’s five piece flatware set that Oneida made? Makes a GREAT shower gift. Although we don’t make a 5 piece set for infants/children – we do make a 3 piece set – Baby Liberty. It is adorable and as you said – makes a GREAT shower gift. 100% made in America! I love your product . It’s so well made . It never bends . Mine is stainless steel with a hand pounded design that receives many compliments . I’m so happy to hear about you. I have 18/8 (my moms strict instructions to never buy anything else, without explaining why) stainless Oneida (now 20+ yrs old) that I love, but I later furnished boat galley with an inexpensive off brand set…was shocked at how cheap it was, and got rust spots from dishwasher!!?!!. I then educated myself on 18/8 and 18/10….most buyers (younger gen) have no clue. Educated my daughters, then noticed that most boxes of flatware don’t state metal composition on the boxes (as they used to). So glad to know you are keeping this trade alive, and in the US. More education on quality is needed for those who don’t know. Very excited please keep me posted. fantastic. I didn’t know about the samples. I’ve already been in email contact. I’m so happy to have learned about Liberty! I want to buy American Made, period. I’ll continue reviewing patterns on line..then order a sample. I bought Oneida flatware exclusively until they became just another ‘Shell’ of a former great American Co, now an offshore product, simply riding the name recognition. I’m stoked to hear about Liberty and have several purchases planned in the near future, with the holiday cooking season approaching. Woo hoo!!! Made in America!!! Do you have a catalog??? I purchased a set of Onieda flatware and a set of Cutlery a few months ago. While it was a vast improvement on what I had, I was very disappointed to read the “Made in China” in the instructions. Wish I had known of you then!!! You guys rock! Keep the “Made in USA” banner flying high. Glad to hear you are doing well. I worked for Oneida for many years and it was a sad day when it closed. I hope you continue to grow, you make a fine product so I am sure you will. I LOVE to see manufacturing in/returning to the U.S.! So glad to know about this. Trump must love you guys! I can assume your flatware is in use at ALL Government dining rooms including all White Houses! Tom, not yet but we are working on it! I have Oneida Stainless flatware from 40 years ago – recently bought Liberty Stainless flatware for a gift . . . if anything, yours beats out the quality and finish of the ‘old stuff’. Until I did the ‘homework’ for this gift I had no idea how sadly the decline in materials/workmanship had fallen over the decades – it was a joy to buy such great flatware and get Made In America as a bonus! Best Wishes for great growth and success. Bravo! So proud of you! Will make sure nieces and nephews know about your company when they decide to get married or move into their own apartment! Keep up the good work! would love to see this sold in Ohio.shipping is a deterrent in cost. Keep us informed if you start selling through a distributor in Ohio. I would love to have silverware Made in the USA. Where can I get them. https://libertytabletop.com Check out the website for great specials and the pattern of the month! Do you have a store in Sherrill at the factory? You can stop in to see us here at the factory or visit the White Begonia boutique in Sherrill where you will find all of our flatware patterns for sale. So happy to see that you are making silverware in Sherrill, N.Y. I wish you would open the Oneida store again that was in Sherrill also, loved shopping there for gifts!! I have Oneida flatware. Love it. So glad they are still in business..
Good to see a made in the USA flatware company. Hard to find will made stainless flatware now days. I still use some Montgomery Ward flatware I got in the early 60s, made in Japan. In later years I never could find anything that equaled the quality and weight of them. They look as good today as when they were new. Great to hear this. The US consumer has been duped into using this dead-soft thin crap from overseas. Go to a restaurant and the first thing you have to do is use your knife to straighten the tines on your fork. Fork tines have no points – you stab your food 10 times in order to pick it up. This has become the norm because people have dumbed-down to accept it. We still have our Oneida stainless from years ago – and I worked for the company that supplied the stainless – Allegheny Ludlum Steel. Love to buy products made in USA! Are the materials American made as well? Yes, our stainless steel is 100% melted and processed in the United States!